When friends and family ask me what I’ve been up to lately, my response is typically “Chopping vegetables.” Though I love my improved health and reduced symptoms (and weight loss…25 pounds so far) from foregoing gluten, sugar, and dairy, I do admit that cooking almost every meal at home is seriously taking away my free time. My me time. So this weekend my hubby grilled a plethora of meats, and I cleaned and prepped an entire refrigerator full fruits and vegetables, in an effort to save time and have (almost-) ready-made meals on hand throughout the week. Advanced planning aside, though, some nights I dread the clean-up more than the meal preparation itself. Last night was one of those nights. Since this is my first week following the autoimmune protocol, I didn’t want to skimp on yummy food just to avoid doing the dishes. Browsing through my saved recipes on Pinterest, I re-discovered this roasted cauliflower recipe from Running with Tweezers. Dates? Olives? Rosemary? Yes, yes, and yes. With recipes like this, how could I miss tomatoes and peppers? But I wondered if I could be lazy get creative and simplify the recipe. Remember, the fewer dishes, the better. I plopped my bag of prepped (cleaned and chopped) cauliflower in a shallow pan and tossed it with olive oil. Right in the pan. 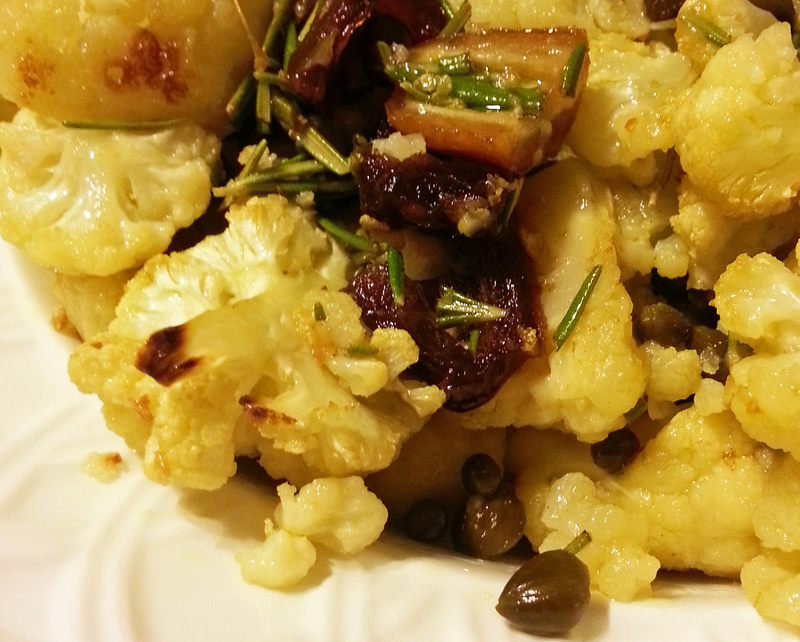 While the cauliflower roasted, I combined more olive oil with chopped dates, fresh rosemary, and…wait for it…capers in a small bowl. I decided to swap the capers with the olives, because it saved some chopping time. 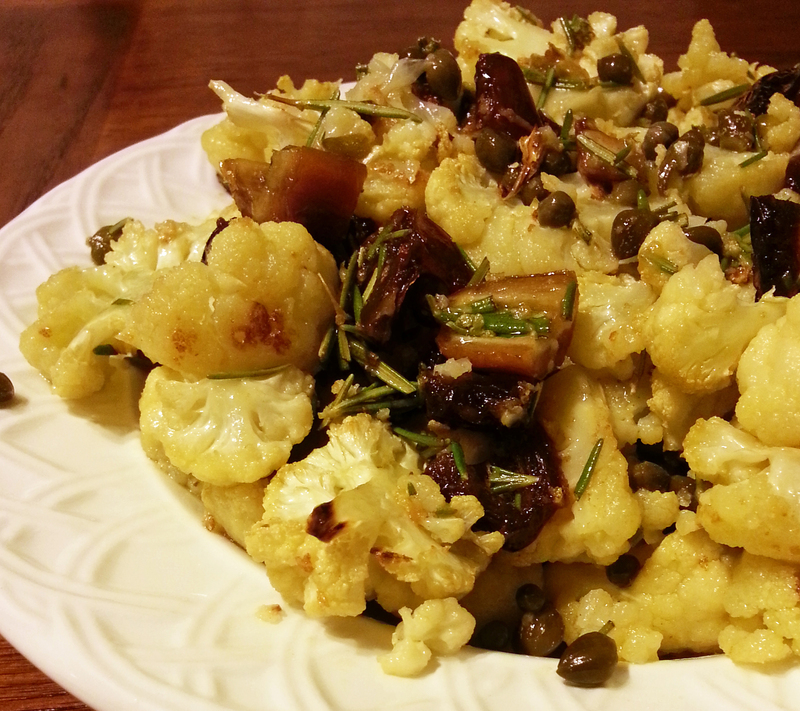 And I love cauliflower with capers. Using olive oil in place of butter allowed me to eliminate the need to melt the butter in a separate pan. After roasting the cauliflower until the edges began to crisp up a yummy golden-brown, I took it out of the oven and pushed it all toward the center of the pan. Then I dumped the date/caper mixture right on top of that roasted goodness. Yup, right in the pan AGAIN. A few quick tosses, and I popped it all back in the oven for another five minutes. Then the cauliflower went straight from the pan to my plate. Above is what I’m calling the beauty shot. You could add salt and pepper to taste before plating, but I found the capers seasoned the dish enough to more than please my palate. And I’m avoiding pepper in this early phase of AIP. This dish is definitely a do-over. One bite hits all the right flavor notes: sweetness from the dates, salt + sour from the capers, and a slight bitterness from the rosemary. And I especially love that I only had one pan, one bowl, and a silicone spatula to clean at the end of the night. Sharing this recipe at Sift, Stir, and Savour, Mostly Homemade Mondays, Easy Green Mama, Real Food Forager, and The Gluten-Free Homemaker. Preheat oven to 375° Fahrenheit. Combine 3 tablespoons of olive oil with the dates, capers, and rosemary in a small bowl and set aside. Toss the sliced cauliflower florets with the remaining tablespoon of olive oil in a roasting pan or rimmed baking sheet. Place the pan in the oven and roast the cauliflower for 25 minutes, or until the edges begin to turn a golden brown. Remove the pan from the oven and push the cauliflower together into the center of the pan. 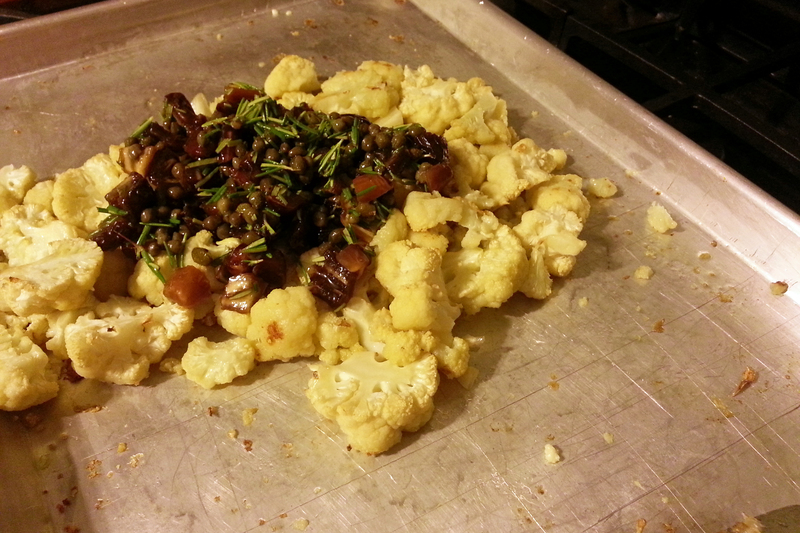 Pour the date/caper mixture over the cauliflower and toss. Return the pan to the oven and roast the mixture for another 5 minutes. Remove from the oven and season with salt and pepper if desired. Serve immediately. This entry was posted in 365Project, Inspiration, SeeKarenCook and tagged #AIP, #autoimmune, #cauliflower #recipe, #lowcarb, #paleo on October 23, 2013 by annumography. I know, right? 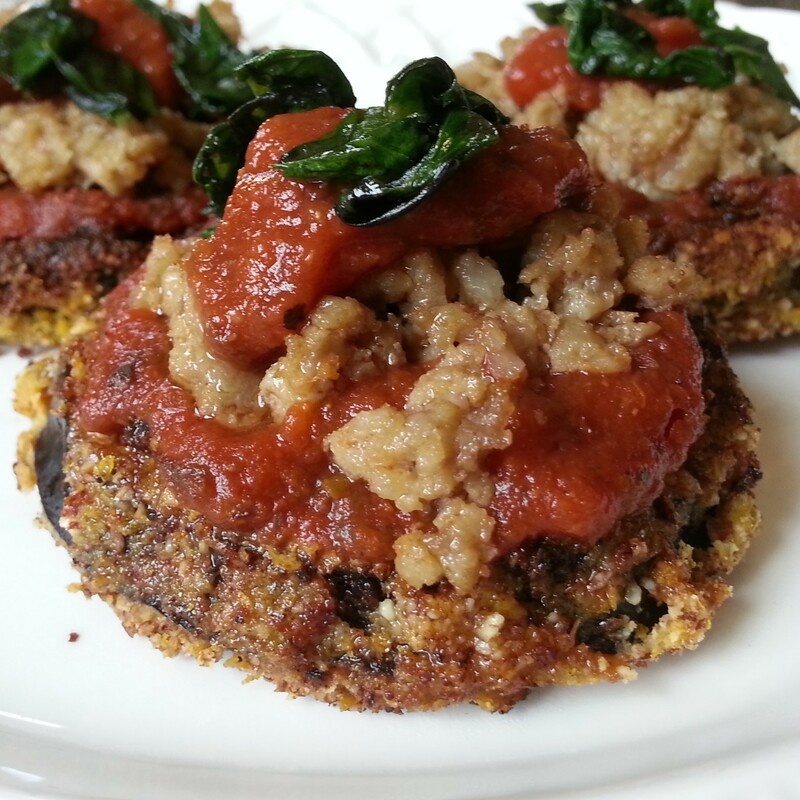 This grain-free eggplant parmesan recipe from Miss Dot’s is seriously something that needs to be in your gluten-free cooking repertoire. I skipped the cheese and added sausage, Local Folks Foods pizza sauce, and crispy basil (basil quick-fried in olive oil), and I used olive oil in place of grape seed or coconut oil. Just so you know, we didn’t miss the dairy AT ALL. My hubby ate leftover eggplant the next day with his favorite spicy muffalata. Yum! It is with some sadness, however, that I post this culinary triumph. You see, I am weaning myself off a host of foods on which I rely daily. I’m going to give the Autoimmune Protocol (AIP) a try. The answer to my friends’, family, and co-workers’ “So, what do you eat?” is going to be that much more challenging to address. And I can’t help thinking that I have to re-learn everything that I’ve been so successful in learning over the last few months. But I think it will be worth it in the end. What is AIP? Check out The Paleo Mom for a great, easy-to-understand resource about AIP (it’s where I started). I’m a HUGE fan of her blog; an evidence-based approach to the paleo lifestyle and managing autoimmune disorder symptoms, whaaat? The list below is from her post on AIP. So this is what I won’t be eating for the next two weeks. Or month. Or forever. I’m not ready to talk in much detail about why I am planning to “go AIP”, but I promise more information on the why’s and my results in future posts. Why not now? Because I am still waffling between the Contemplation and Planning stages of change (Transtheoretical Model, or TTM). Okay, stay with me. What you may or may not know is that I have a master’s degree in social work, and this may be the closest I ever get to using it. But as I have noticed my own transformation from first ignorance, then denial (pre-contemplation), then a desire to learn more and seek advice (contemplation), and now finally beginning to prepare in a VERY PUBLIC way, I recognize that this is a process. I can’t quit cold turkey and succeed (i.e. know thyself). And TTM isn’t as linear as it looks. If I fail to move on to the action stage, it’s more likely because I have slipped back down into contemplation (or…Lord help me…pre-contemplation) stage where I need a little more time/work. But what better way to avoid slipping than to be accountable through sharing my intent to change and my progress on this blog. Sharing this post on Allergy Free Wednesday. This entry was posted in 365Project, Inspiration, SeeKarenCook and tagged #AIP, #autoimmune, #eggplant, #glutenfree, #grain-free, #paleo, #socialwork, #TTM on October 15, 2013 by annumography.